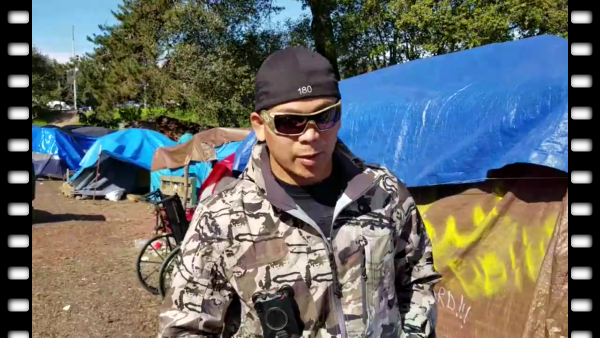 At Ross Camp, Plain Clothes Police Officer Claims He's "Just a Ride-Along"
The video begins by following a uniformed officer with the Santa Cruz Police Department on a walk through the homeless encampment. Also present, and visible at different times throughout the video, is a second individual who is wearing sunglasses, plain clothes, a cap, and a camouflage jacket, and who is silently following the uniformed officer. Before walking through the camp, the uniformed officer put gloves on first. 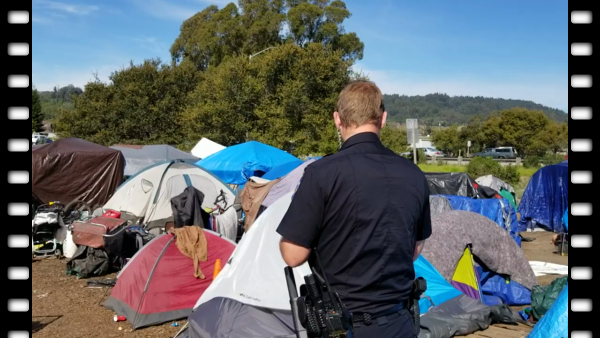 The uniformed officer is shown walking closely next to the tents, and in between them, while occasionally attempting to look through cracks in the openings without warning the occupants first. The video also shows the officer touching one individual's bicycle and looking at it closely without asking the owner permission to do so. At one point the officer looks down at person lying next to a tent and, asks them "are you alright?" and "are you ok?" until the individual responded. Additionally, the officer made sarcastic remarks and was rude to the camera person, who was simply exercising their first amendment right to film the police interaction in a respectful manner. At about halfway through the video, the person in plain clothes who was walking behind the first officer (and behind the camera operator for most of the time) spoke to the person filming. "I'm just a ride along, Mam, I've got nothing to do with the cam," he told the person filming. "A ride along?" she responded. "Yeah, right here, Just a ride along," he said, pointing to a police body camera that was attached to the front of his camouflage jacket. "It's not a police camera?" she asked. "Yes, they gave me a police camera. It's part of the thing," he told her. "Oh," she responded, choosing not to ask any more questions. The individual has been identified as Santa Cruz Police Officer Ruben Badeo. The hat he was wearing had his badge number clearly marked on it, however that was the only marking that made it obvious the hat was part of an official police uniform.